This grit or salt container is designed with a wide mouth for easy access to the contents and slim line shape for position flexibility. The bins are able to be stacked up to six high and this enables a very efficient use of both storage and transportation space. 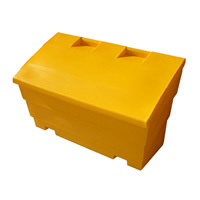 The bins are made from UV resistant and durable polyethylene that makes a rugged and water tight container for a wide range of contents. For local authorities, distributors or other large users.